Improves safety, accuracy, time and productivity — while reducing costs for fabricators. Fabricators who prepare piping for application in new construction or renovation projects face numerous challenges. These range from the costly problems of unpredictable environmental factors, human error and integrity of the piping, to the very real, crucial issues of worker safety. A new, fully automated, computerized advanced grooving device has been introduced that drastically reduces the possibility of measurement errors, while making the fabricators’ workplace a markedly safer and more productive environment. The new technology comes in the form of the “intelligent” RG5200i Roll Grooving Tool from Victaulic, the world’s originator and leader in the development and production of mechanical pipe joining solutions. 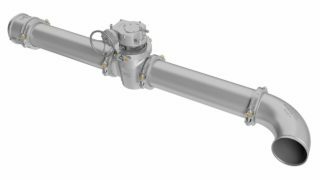 Company officials and end-users report that the device is changing the system of pipe fabrication and, ultimately, ushers in the era of an entirely new and highly exacting method of pipe grooving. In development for years yet formally introduced in August 2016 by Victaulic, the RG5200i Roll Grooving Tool represents a significant advancement in enhanced workplace safety, reduced man-hours, reliability, cost-effectiveness, and precision pipe grooving. 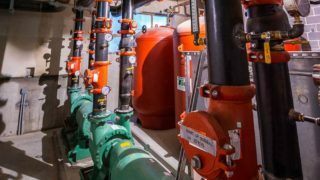 Matthew Puzio, Senior Electrical Engineer at Victaulic, notes that the new technology answers calls for increased worker safety, as much as it does for creating a more streamlined, efficient workplace. “Today, machine tool builders focus on using safety devices to drive efficiency in the manufacturing environment. Since Victaulic is already world renowned among fabricators and engineers as a leader in mechanical pipe joining technology that largely eliminates the need for potentially hazardous welding, the company saw the need for an ‘intelligent’ grooving tool that went several steps beyond safety, reliability and efficiency. Victaulic engineers envisioned a grooving tool that would put worker safety at the forefront — while revolutionizing the way fabricators perform their often complicated and time-consuming trade. With the right technology, Victaulic engineers felt fabricators could work to more exacting standards, reduce man-hours, cut costs, improve the integrity of the grooved pipe, and do it all in a safer work environment. The RG5200i Roll Grooving Tool has achieved all of the aforementioned goals. The tool succeeds in fully automating the grooving process — while integrating cutting-edge proprietary computer software accompanied by laser technology to yield precision results. “The technology available to us now, compared to even five years ago, has been a big player in permitting us to make some of these components,” Mr. Puzio explains. “That is what spurred the idea to create the smart tool.” When the Victaulic team approached designing the RG5200i, the focus was on lean fabrication, improving how operators use the tool, as well as a renewed concentration on ergonomics. Paramount within the tool’s design are its built-in safety features. The RG5200i Roll Grooving Tool is designed with a proximity “no-go” zone surrounding the perimeter of the machine; that is, should anyone enter the safety zone, sensors detect movement and the operation is automatically halted. “In fabrication shops, it’s safety first,” insists Mr. Puzio. This technological enhancement avoids accidental start-ups, a critical safety feature. The RG5200i Roll Grooving Tool virtually eliminates costly shut-downs, keeping the work on schedule. In addition, operators work from a remote pedestal located away from the actual grooving mechanism, adding another element of worker safety. Before the advent of the RG5200i Roll Grooving Tool, fabricators using traditional pipe end preparation tools had to rely on their machine operators to execute and analyze the correct groove. “Some fabricators were concerned that there wasn’t enough shop staff to handle it,” Mr. Puzio explains. They’d be reluctant to dedicate a welder to a grooving tool, so they would often have to opt for a less experienced employee to expedite the job. “But [worker training and experience] concerns could arise,” Mr. Puzio acknowledges. The RG5200i Roll Grooving Tool renders that issue moot. Since it’s automated, “it allows anyone to use it,” he explains. “This builds confidence in the user, be it a newcomer or a 20-year veteran.” Additionally, the tool builds the customer’s confidence that they are creating an in-spec groove while reducing variability in the manufacturing process. Designed to groove carbon steel pipe in diameters from four inches to sixty inches, the RG5200i Roll Grooving Tool takes the guesswork out of pipe grooving because it converts much of the effort from a manual to an automatic process. Thanks to laser technology, pipes are grooved to exact specifications, with a record of every pipe groove stored in a database. Among the chief attributes of the RG5200i Roll Grooving Tool is its focus on data acquisition technology. “While the tool is grooving it’s reading all of the dimensions,” Mr. Puzio explains. “When it hits the diameter target, all numbers are read and recorded in our system.” This amounts to “full traceability” of every aspect of every fabrication job, he notes, which represents a major step forward in fabrication technology. The intuitive nature of the RG5200i Roll Grooving Tool stems in large part from its reliance on patented grooving process and proprietary software, developed by Victaulic specifically for the new tool. In addition to safety, accuracy and reliability, chief among the tool’s advantages is its focus on ease of function and operator use. Ergonomically, it is a vast improvement over manual grooving machines. Operators of older machines had to manually work a foot pedal for hours on end, a tedious aspect of the job. With the new automatic tool, operators can stand by and observe the grooving process, without succumbing to fatigue — further reducing the possibility of a workplace mishap. “Now the whole process is much more comfortable for the operator, and it drastically reduces risk,” Mr. Puzio states. While operators still need to monitor the process, the automated grooving tool makes the entire procedure easier and less physically demanding overall. Since its formal introduction, the RG5200i Roll Grooving Tool has already received accolades from customers. Dave Liggett, Mechanical Fabrication Shop Manager at S.A. Communale, has worked in the industry for a 25 years; he’s been relying on Victaulic grooving tools the entire time. The RG5200i has already had an impact on his business. The new machine is also well received by Mr. Liggett’s colleagues, he says. “The personnel like it; they like being able to hit the button and let the machine do all the thinking. Victaulic has received high marks from companies like Ferguson/FEI, the number-one purveyor of wholesale commercial and residential plumbing supplies in the United States, to suppliers and fabricators of all sizes. “The biggest challenge with grooving pipe has to be grooving the pipe to specification required,” explains Jimmy Utz, Fabrication Shop Lead at Ferguson/FEI. “Anyone can take a piece of pipe and put a groove in it. The challenges become, how do you get the ‘a’ dimension, the ‘b’ dimension and the ‘c’ diameter and control the flare. Those are your challenges. We absolutely track every groove that we run through here. We currently check 100% of our ‘c’ diameters; on roll groove pipe we check the first, the 30th and last of every ‘a,’ ‘b,’ ‘c’ and flare. All of that data is then taken into the office, punched into a database, scanned, registered and saved. Mr. Utz says he is switching to the RG5200i because of the ease of specification and ease of acquiring specification. He also says it gives his team confidence in the accuracy of their grooves and aligns them more strongly as a vendor and distributor with their end customers. Mr. Puzio of Victaulic sees the new tool as a boon for businesses going forward. “A wide range of companies will be using this tool,” Mr. Puzio predicts. “Usually it’s competitive; two or three fabricators compete with each other, and that’s what drives people to select this tool. Our questions are: How do we focus on quality and give our customers what they want? How do we make our shops more productive? These are our thrusts: to make shops more productive and competitive in their industry. This tool is another component in that mission and trend.